There’s a lot to be said for sitting tight and remaining focused on work and crossing things off the to-do (or as I like to call it, the Teux Deux) list. And this month, my list is looooong. So it’s the nose to the grindstone and all of that productivity business, I guess. I’d love a set of octopus arms right about now because that would be kinda cool, dontchya think? In the meantime, I’ll settle for simple. The call for take out is easy, but I promise that this meal isn’t too much effort. 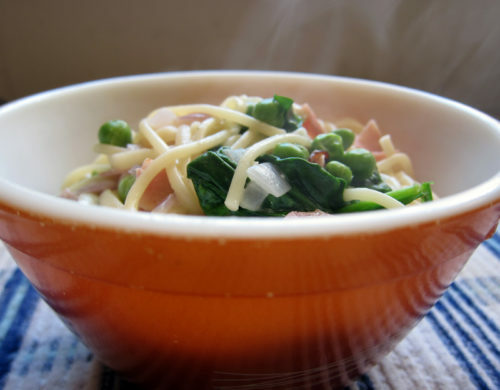 This dinner is familiar and comforting and almost a necessity in times of stress. A big ol’ bowl of pasta? Oh yes please! But this pasta isn’t rich with heavy cream, or cream cheese. Instead, it gets its creamy sauce from just a generous tablespoon of plain old yogurt. 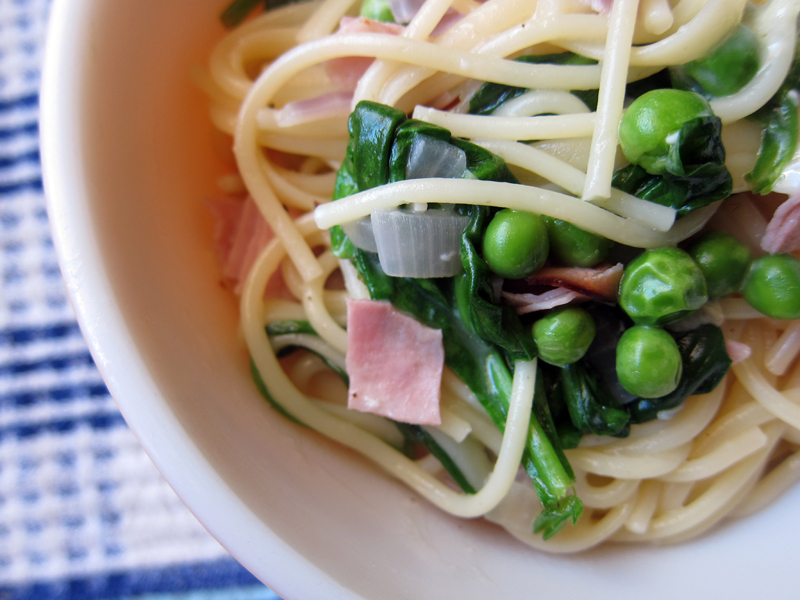 Plus, there’s some smoky ham, bright green spinach and peas to keep everything friendly. Minced garlic and Parmesan cheese is a requirement, natch. Don’t stress it. Dinner is ready. elsewhere: Thinking about muffins? Trust me, you’ll be baking up a batch of these delicious marmalade muffins asap over at Poppytalk. They’re lovely. A touch of lemon zest & a squirt of juice would be nice here stirred in just before serving. Boil pasta in salted water according to package directions. Meanwhile, heat oil in a large skillet over medium heat. Add in onion, garlic and ham and let the flavours meld for a good 5 minutes, stirring occasionally. When the pasta is cooked, drain away some but not all of the pasta water (about 1/2 cup of water left in the pot is good) and toss into the skillet. Stir in peas along with the yogurt, parmesan and butter and toss well. Add in the spinach and let that wilt a bit. Taste and adjust seasoning. Serve with additional Parmesan cheese. Makes 4 servings. Hahahahaha teux deux. Made me lol a lot. Love this easy dinner solution! Ugh…to-do lists. I definitely have one and I’ve definitely been ignoring it! Need to refuel with a quick and easy pasta like this and get to it! 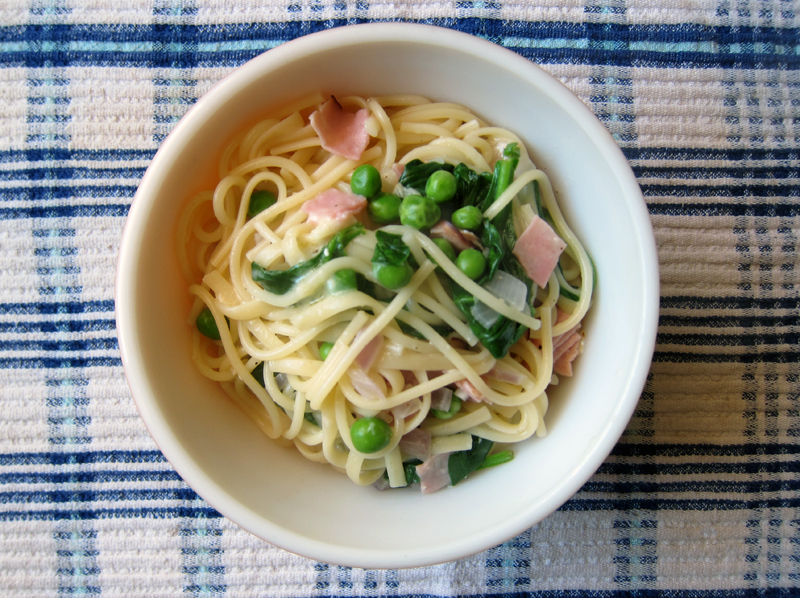 never ever thought to use just a cup of plain yogurt to kick up a pasta dish. excellent idea my dear! I love noodles and I have every one of these ingredients in my fridge. What to make for dinner tonight is now checked off my Teux Deux list! Thanks! Ugh, the dreaded Teux Deux list! Haha, I seriously want to rip mine up right now. Love that this is simple enough to pull together quickly but also healthy and GOOD! Can’t wait to try it. I miss pasta. Ever since I switched to gluten-free foods, I have had a hankering for pasta dishes. Rice noodles just don’t have that same texture. I’ve added yoghurt to pasta in the past and I must say it’s a great thing to get in the habit of doing. It’s both delicious, creamy and healthy. Rina, it’s an awesome name & I love the list app. The best! Thanks Amanda, we can all use a little dinner help now & again. Joanne, it must be a crazy busy month all around! It works really well, VanillaSugarBlog – though I think a cup would be waaaaay too much. Glad I could help out with dinner ideas, Meghan. Joanne, have you tried kamut pasta? I like it and I’ve heard good things about corn pasta. Good luck satisfying those pasta cravings! TeuxDeux is awesome, Lisa. No prob! Looks yummy 🙂 I usually don’t eat pasta because of how heavy it usually is but this dish looks healthy and full of yummy foods 🙂 I like that the sauce is yogurt based! I make lists all day long. I have to do lists for the day, to do lists for the season and shopping lists for food and other things. I always put a few easy tasks in there because the feeling of achievement is wonderful. This is the first time I have tried a recipe from your site and all I have to say is THANK YOU!! We just had this for dinner and it was seriously the best pasta dish I have had in a long time. I used mushrooms instead of ham. I have never heard of using yogurt as a pasta sauce and I love how it kind of just melted in to the background with the butter and created a silky mouth feel without making the dish blatantly milky or creamy. Now I’m going to browse your site to find tomorrow’s dinner recipe! I think this would be a very kid-friendly dish, Melissa! Let me know if you give it a try. Jocelyn, it’s nice and light with the yogurt – not too creamy or heavy at all. Kim, thanks so much for commenting – and for trying one of my recipes. Glad you enjoyed it and I think mushrooms sound like a great substitute. Enjoy browsing around! I just made this. You are the best. Thanks Curly J, it does make for a good simple dinner. Enjoy! AL, thanks so much! Glad you enjoyed.